Antique Embossed Tin Trunk Painted Again! 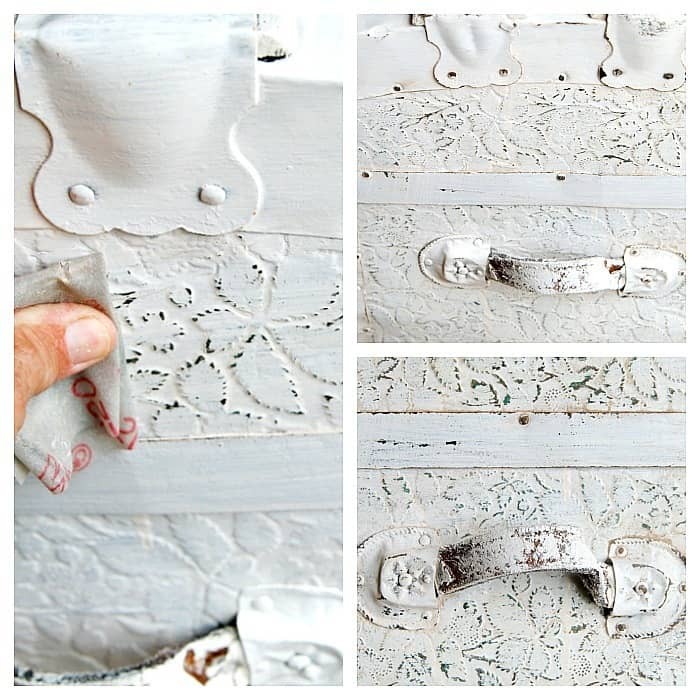 Learn how to paint and distress an antique embossed tin trunk. 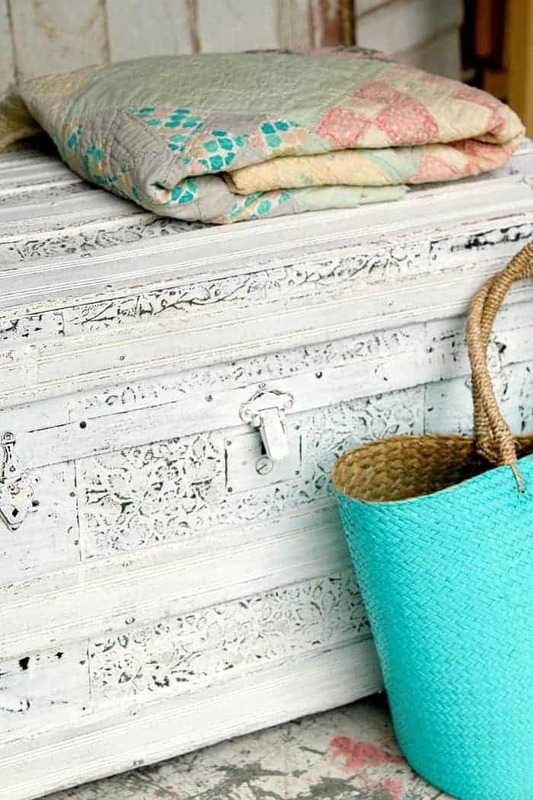 It’s okay to paint antiques and distressing the paint adds character. Have you painted something and you just weren’t happy with the outcome? I think we all have. Sometimes I paint things more than once……or twice. It’s okay to do that. 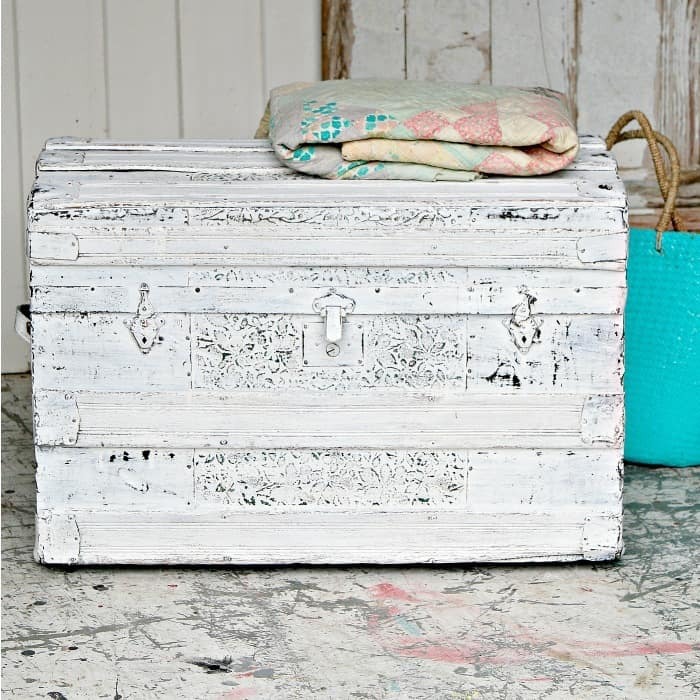 The embossed tin trunk I painted a few years ago is the perfect example. I didn’t like how the trunk turned out when I tried a paint makeover 3 years ago. But I left it that way……looking not good. It set in the master bedroom until a few months ago and was a clothes catch-all. I bet you guys have a catch-all piece for your clothes too. 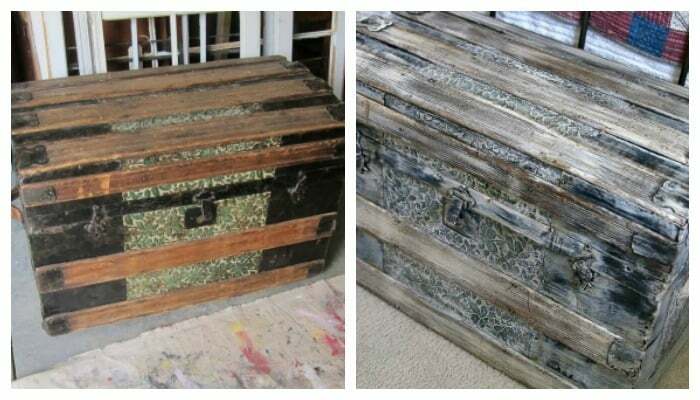 We moved the trunk out to the workshop when it was replaced by a cedar chest I painted and didn’t want to give up. The trunk has been waiting for a ride to my booth at the shop. Yep, it was going to be gone. I was looking for a piece of furniture to paint this week because, well, I just wanted to paint something. I spotted the trunk and decided to see if I could make it look better. Couldn’t hurt. Some of you probably will not like the fact that I painted this trunk in the first place. It was a mess to start with. The tin is torn and pulled away in places and the wood is a bit buckled. So it wasn’t really a candidate for refinishing. The trunk turned out so well I thought about keeping it but I like the replacement piece better. That’s what happens around here. Something better comes along and you’re gone. The distressing was the key to the perfect look. 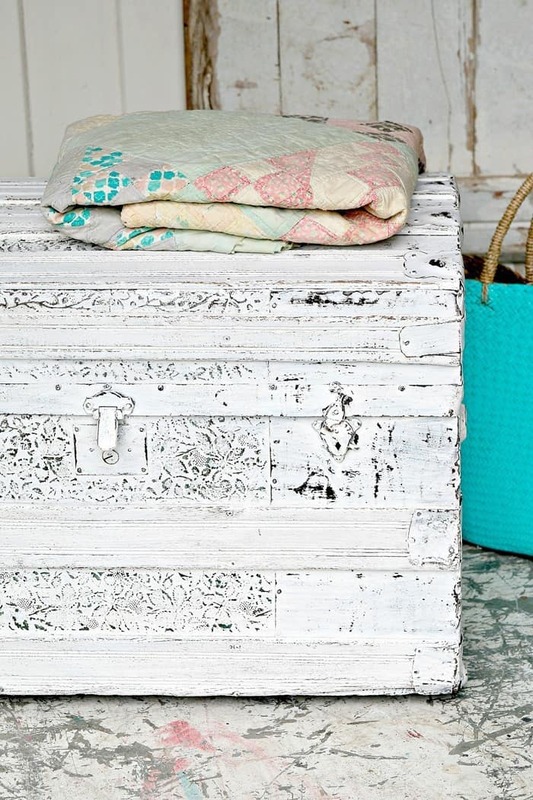 The trunk is made of embossed tin, metal, and wood. 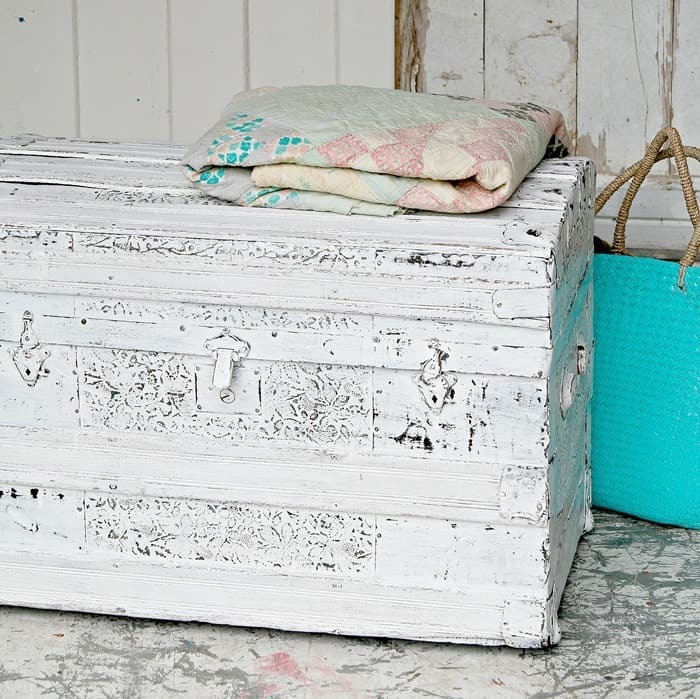 The embossed ivy pattern looks fantastic distressed. The photo on the left shows how the trunk looked when I bought it. I think I paid $75 for it at a local antique shop. That was 8 or 9 years ago. I’ve learned a bit about prices and where to find bargains since then. The photo on the right is how it looked after I “painted” it in 2015. I looked back at my old post and the post ended with “I’ll share the paint tutorial later”. I never shared the tutorial. Probably because I didn’t like what I did to the trunk. Today is Furniture Fixer Upper Day and my talented friends have projects to share too. The links are at the end of the post. Time to talk about the new paint job. I mixed two Behr paints together to get an off-white. Still trying to use up all that paint on the shelves. The paint doesn’t look off-white until you hold the white paint against it. I applied two coats of paint. I grabbed the flexible 3M sandpaper 220 grit and started distressing the paint. The paint was coming off but not very much and not very fast. I changed to flexible sandpaper 100 grit. It was a bit better but I was still working too hard with little to show for it. I changed to regular sandpaper 80 grit and that did the trick. It still took a bit of time and work to distress the paint on the whole trunk. I would step back, look at my distressing results, and say “not enough”. I finally quit. The embossed tin just looks so pretty distressed. I noticed when distressing the trunk that a bit of the stain or something was coming through the paint in areas. That was okay because it gave the paint a bit of an aged look. The trunk really does look better now…..and different. The top of the trunk is slightly rounded which means it’s not a candidate for a coffee table or side table. That’s one reason I’m letting it go. The trunk latches don’t want to close easy either. I just leave the latch open. I staged the photo with a vintage handmade quilt from my collection and a pretty turquoise straw bag I picked up at Michael’s on clearance for $4. A steal. I also bought several containers of varying colors of pom poms at clearance price. I love yarn pom poms but they take a while to make. I’m thinking of gluing pom poms around the top of the straw bag. I saw a similar bag with pom poms and the price was crazy! 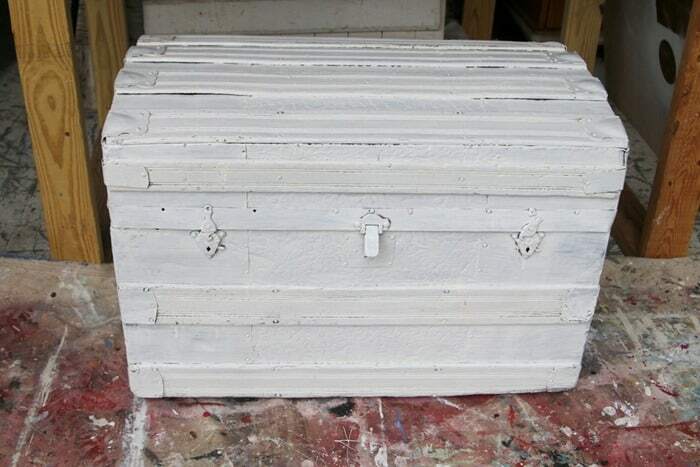 I have a World War II foot locker/trunk I didn’t paint. Just cleaned it up and added wheels. See it here. This is a great idea. I have a trunk and have not been able to decide just what I wanted to do to it. You are an inspiration. Thanks!!!! I’m not sure I understand your question Donna? 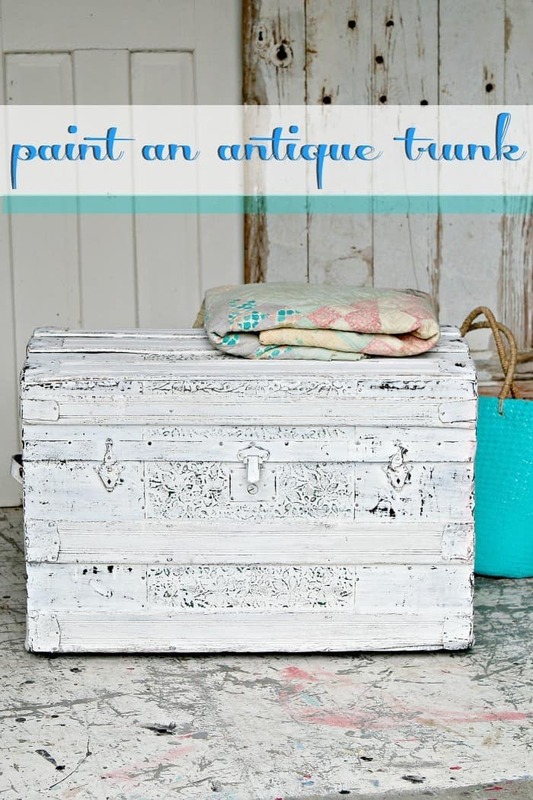 Do you mean the trunk or are you talking about a cedar chest I painted in the past? Haha, I think I remember this makeover the first time you shared it! (Good old TFMD.. we’ve come a long way, LOL) It looks absolutely gorgeous now, like the white and distressing were meant to be. I didn’t even notice the embossed tin before! Love it! One of your best pieces yet. I like it but would distress the wood to show a little wood color. The second time’s the charm! Looks great! I think we’ve all been there at one point or another and fun to see our paint journey. I love the new look! The final result is stunning. Glad you like to paint because that was a very time consuming project!